Bengal gram also known as chana dal is baby chickpeas that has been split and polished which is delicious, nutritious and easy to digest. Apart from being used in soups, salads, curries, dal preparations, savouries, sweets and rice dishes, the legumes are also roasted and powdered into flour (besan), another ingredient that is widely used in almost every province of India. Is Bengal gram safe for diabetics? The glycemic index of raw Bengal gram dal is extremely low around 8 which makes it super food for diabetics. This is best understood by the glycemic load which is only 1.4 that depends on the carbohydrate content in 1 serving of raw chana dal (approx. 30 grams) .i.e. around 17.9 grams. The high fiber content of the dal allows slow release of glucose into the bloodstream and manages your blood sugar levels. Since it has negligible amount of fats, helps in lowering your cholesterol levels. It also contributes in managing your blood pressure. Is Bengal gram suitable for weight loss? 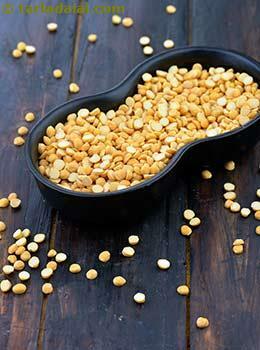 Chana dal is fat and cholesterol free which will help you in losing some extra pounds. It is also rich in protein so you can combine your dal with any cereal like Jowar Roti, Bajra Roti, Whole Wheat Roti to make it complete protein. The fiber content of raw chana dal is 4.6 which will keep you full for a longer period of time and controls your appetite. Hence less calorie intake.